May 30, 2007 Albuquerque, New Mexico - Here begins an overview of five American crop formations, all in the month of May 2007. Each one is near Native American and ancient earth mounds reminiscent of the closeness that Wiltshire, England, crop formations also have to ancient stone circles and earth mounds. Home of Cherokee Indians; many earth mounds west of Asheville. More upcoming in Part 4. 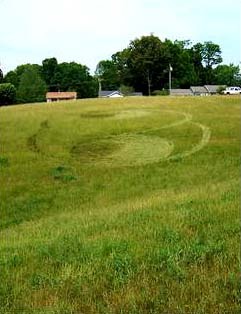 Asheville, North Carolina, resident Danny Tetrault sent in these photos of what he described as a crop circle he saw in West Asheville on Sunday, May 27, 2007. The grass formation can be seen off of North Bear Creek Road. Image © 2007 by Asheville Citizen-Times. Next PostNext Is Earth Close to Dangerous Tipping Point in Global Warming?